← Peter Foley: A survivor, adventurer, a dedicated family man. 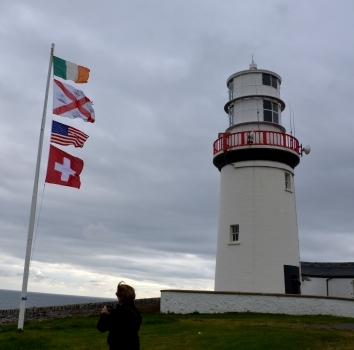 Lighthouse on September 23, 2012, showing four flags: Irish for the Irish role in the Fling Tiger 923 rescue effort, the official flag of Commissioners of Irish Lights, US flag for those on the aircraft, and Swiss, for the Celerina rescue team. That is mostly true, except that it is important for readers to know that the lighthouse continues to be operational under a program which is now partially automated. Galley Head continues to play a vital role in protecting Ireland’s West Coast. The Commisioner of Irish Lights Safety and Quality Coordinator Robert Sparks reports that, “Galley Head’s light continues to shine brightly every night under the careful supervision of its current Attendant Lightkeeper, Gerry Butler. The Lighthouse ended traditional operations, and was de-manned and automated in 1978/1979. This means that it was no longer watched by a team of Lightkeepers on a 24/7 basis working a shift pattern to ensure constant cover. It went to being remotely monitored on a 24/7 basis by Telemetry Systems Officers who were based in Dun Laoghaire, south of Dublin. The three full-time Lightkeepers at Galley Head prior to 1978/1979 were replaced by one part-time Attendant Lightkeeper who attends the station at regular intervals to perform general maintenance duties as well as accompanying visiting officials or technicians. An important function of the Attendant Lightkeeper is to carry out first line maintenance and repair of the lights in the event of a problem with the Navigational aid. In addition, the Attendant lightkeeper serves a representative of The Irish Lights, greets and hosts dignitaries visiting the facility, and serves many public information functions. Attendant keeper Gerald Butler very actively assisted in the coordination and management of the Flying Tiger memorial services and supervised the mounting of the memorial plaque. This entry was posted in MEMORIALS, rescue teams and tagged Galley Head Lighthouse, Gerry Butler, irish light houses, light houses. Bookmark the permalink. Hi Fred, Thanks for keeping me updated on all events. I need some more of your business cards. If you can send me more that would be great! Thanks, Fred. I didn’t realize one could rent a lighthouse.